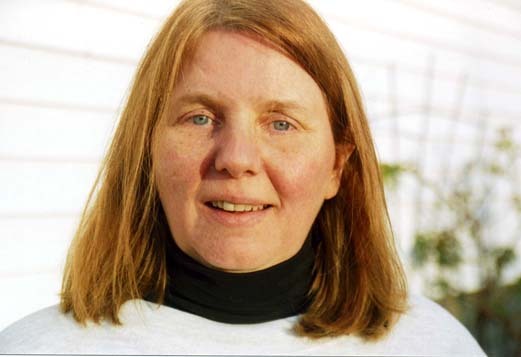 Valerie Lawson. Photograph by Michael Brown. 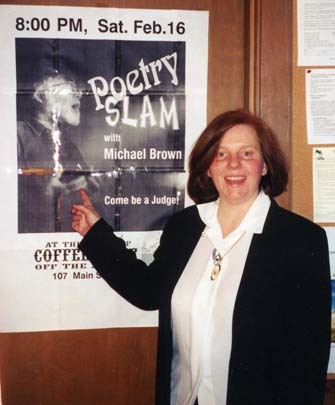 Valerie Lawson got hooked on slam back in 1994, thanks to the South Shore Poets at the Fuller Museum of Art in Brockton. Not long after that, she made the pilgrimage to the Cantab Lounge, drawn by rumors of the legendary poets who performed there. By 2000 she was co-hosting the open mic and simultaneously operating as the SlamMaster at the Daily Grind Coffeehouse in Bridgewater, Mass. She also once co-hosted the Swedish National Poetry Slam with Michael Brown. Valerie Lawson shows off a poster for the first poetry slam at the Old Ship Church Coffeehouse in Hingham, Mass. Photo by Michael Brown. Valerie’s work has been published in Main Street Rag, BigCityLit, Sensations Magazine, and others; in anthologies, and on websites. Her first book, Dog Watch, from Ragged Sky Press, was released in 2007. Twice nominated for a Pushcart Prize, Valerie won awards for Best Narrative Poem and Spoken Word at the Cambridge Poetry Awards. A member of Doc Brown’s Traveling Poetry Show, Lawson also performed at First Night and numerous other venues in New England and traveled to Ireland with the Culture of Peace multimedia cultural exchanges celebrating the United Nations Decade calling for a Culture of Peace. Valerie retired from hosting at the venue in 2004. 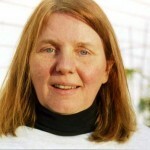 In 2008, she was invited as a Legacy Poet to the first Women of the World Poetry Slam in Detroit. She has lived in Down East Maine with partner Michael Brown since 2007, where they co-edit the Off the Coast literary journal and organize area readings and workshops and a Poetry Slam at Cobscook Community Learning Center.